P. Bordes and A. Chevalier, Musée de la Révolution française: catalogue des Peintures, Sculptures and Dessins, Vizille, 1996, p. 242. Related to a picture formerly in the Sigismond Bardac collection, sold in Paris, 10-11 May 1920, lot 35b, illustrated. Both picture and drawing were made when Robert was imprisoned during the Terror at the Saint-Lazare prison between October 1793 and January 1794. 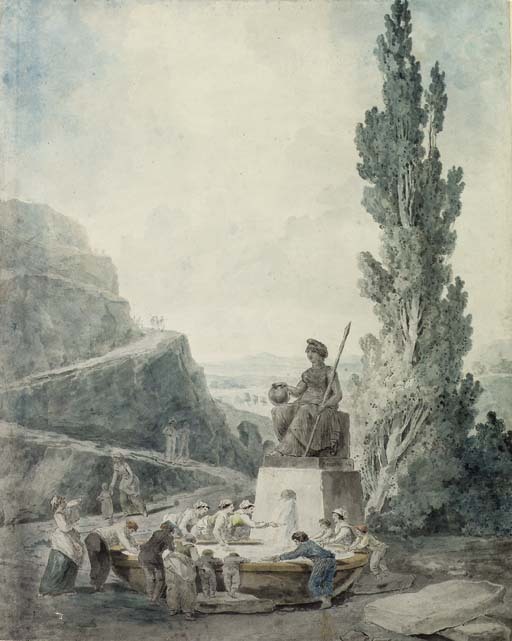 The revolutionary theme is drawn from Jean-Jacques Rousseau, and shows the people drinking at the Fons Libertatis, from which sprouts the Tree of Liberty. A red chalk version of the same composition is in the Musée de la Révolution française in Vizille, P. Bordes and A. Chevalier, op. cit., no. 68, illustrated.